By Hongkiat.com in Web Design. Updated on November 8, 2017 . Any idea how your web design looks like on other browsers? Do you cross browser check to make sure designs and alignment doest run on other browsers? 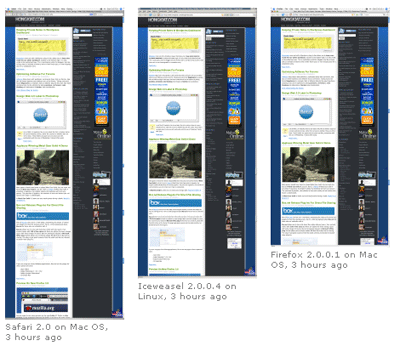 Browsershots helps you to make screenshots of your website on different browsers across different Operating System. This open source free service is brought to you by Johann C. Rocholl. All you have to do is type in your url and click start. Your request will be put on queue. It took me about an hour before these distributed computers start showing me screenshots of my blog in various browsers. Slowness in generating screenshots is perhaps the only drawback of this service. Ready to see how your website looks like on different platform?